Have you heard of Flipgrid? Arianne Dowd recommended it to me (anything she recommends you should check out) and I tried it for the first time yesterday. It was excellent! I am so looking forward to exploring all the possibilities that can be done with it. There are probably blog posts out there about this already... but I haven't seen them yet, so I thought I would share here about this fabulous resources! Flipgrid is a website/app that can be used for asynchronous communication. 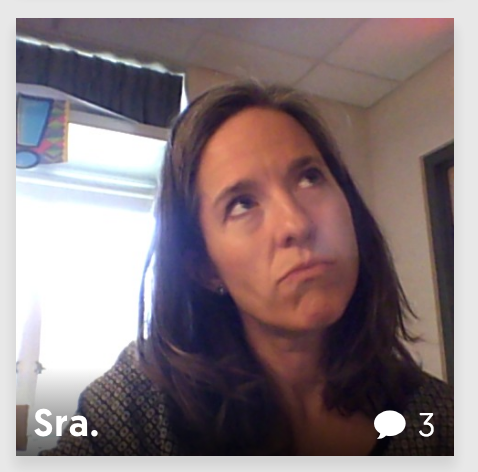 Students get a link to a teacher created "flipgrid". They enter the password and then they can post videos. Other students (or outside "visitors") can respond to those videos. (The subscription costs $65 for students to be able to respond to each other). What did we do with it? We just finished our También la lluvia unit (unit packet) in my AP class, so in order to "discuss" the movie, all students had to post two questions and answer three or more of their classmates' questions. I emphasized that this is interpersonal, so they are just supposed to answer... not prepare notes! Students did an excellent job and enjoyed it! There were 31 questions posted and 122 responses. That is a lot of verbal exchanges! 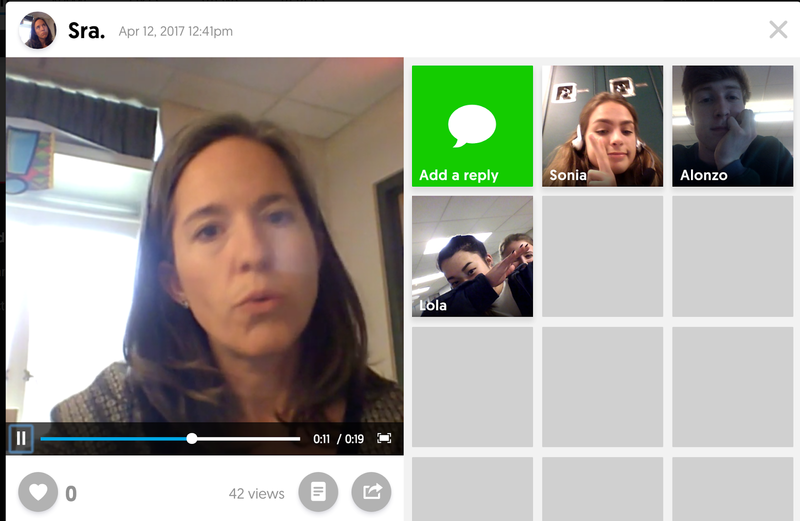 Interpersonal Speaking without the pressure: Flipgrid takes the pressure of off students. They were in the hallway and in the classroom speaking and listening to each other without the pressure of everyone listening to them at the same time. Interpersonal Speaking: It can be challenging really "do" in the classroom. Flipgrid allows for this to happen in a fun way. Listening: Students not only listened to the questions of their classmates, but also they listened to their classmates' responses to their questions. Choice: Students got to choose which questions they answer. Fun: Students really seemed to enjoy this activity! They especially liked taking the selfie that will be displayed for each video (see pensive selfie above). Reach outside the classroom walls! I contacted a reporter via Twitter who wrote one of the articles (Arianne translated it and it is in the unit packet) that we read during this unit and he has agreed to answer some questions from my students. This will be a fantastic and authentic interpretive listening activity for my students. Reach outside the classroom walls! I am repeating this because there are so many possibilities with this, especially because it is asynchronous communication. Obviously interpersonal speaking is much easier to do with AP students because they are top notch students with lots of language ability, but I am planning to use Flipgrid next week with my Spanish 2 students for an interpersonal speaking assessment as well. I hope to share how that goes next week. Thanks for sharing about this. I have just recently started reading about Flipgrid but haven't tried it in my own classroom yet. Did students get to choose who to respond to? I like to give students choices but I'm wondering if you saw any evidence that the 'popular' kids had responses to their videos and others didn't have any. Also, from an accountability standpoint is it easy to see as a teacher whether students really responded to at least 3 videos or is that quite a tedious process to try to figure out? Each student had a partner and had to answer their partner's question and then they could choose. You would have to go through each question to see who responded and keep track of many each student answered. You could also ask them to keep track of whose questions they answer. I love the idea of having them first listen to their partner's video and then having a choice. ¡Muchas gracias por compartir lo que hiciste! I am about to start tutoring an adult couple who wishes to learn Spanish before retiring to Costa Rica in a few years. I have never formally taught in a classroom, and the only tutoring I have done has been with high school or college kids who had textbooks and I just went off of what they were currently learning. I have never had to come up with curriculum cold, and everything online is geared toward classroom teaching. Do you have any recommendations for where I could find ideas to get started? I'm apprehensive about diving in because I don't want to leave anything out or make it too advanced. Thanks!